What Is an SVG File? A file with the SVG file extension is most likely a Scalable Vector Graphics file. Files in this format use an XML-based text format to describe how the image should appear. Since text is used to describe the graphic, an SVG file can be scaled to different sizes without losing quality — in other words, the format is resolution independent. This is why website and print graphics are often built in the SVG format, so they can be resized to fit different designs in the future. If an SVG file is compressed with GZIP compression, the file will end with the .SVGZ file extension and may be 50 percent to 80 percent smaller in size. Other files with the .SVG file extension that aren't related to a graphics format may instead be Saved Game files. Games like "Return to Castle Wolfenstein" and "Grand Theft Auto" save the progress of the game to an SVG file. The easiest and quickest way to open an SVG file to view it (not to edit it) is with a modern web browser like Chrome, Firefox, Edge, or Internet Explorer — nearly all of them should provide some sort of rendering support for the SVG format. This means you can open online SVG files without having to download them first. An SVG File in the Chrome Browser. If you do already have an SVG file on your computer, the web browser can also be used as an offline SVG viewer. Open those SVG files through the web browser's Open option (the Ctrl+O keyboard shortcut). SVG files can be created through Adobe Illustrator, so you can, of course, use that program to open the file. Some other Adobe programs that support SVG files (so long as the SVG Kit for Adobe CS plug-in is installed) include Adobe Photoshop, Photoshop Elements, and InDesign programs. Adobe Animate works with SVG files, too. Some non-Adobe programs that can open an SVG file include Microsoft Visio, CorelDRAW, Corel PaintShop Pro, and CADSoftTools ABViewer. 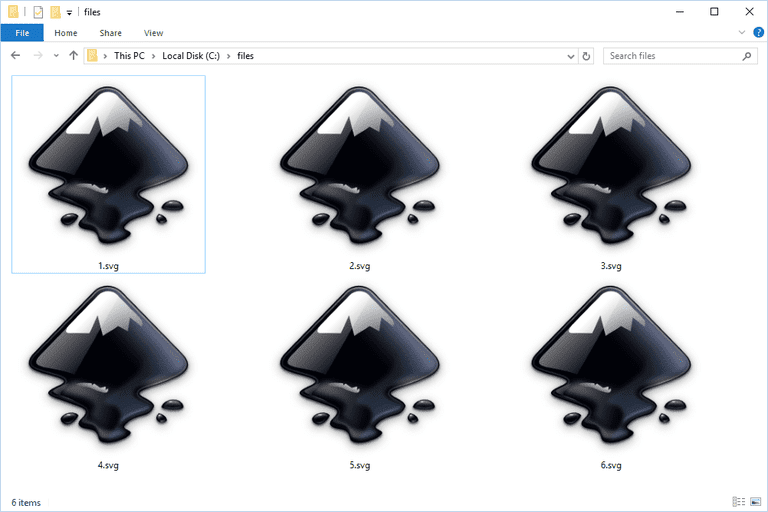 Inkscape and GIMP are two free programs that can work with SVG files, but you must download them in order to open the SVG file. Picozu is also free and supports the SVG format, too, but you can open the file online without downloading anything. Since a Scalable Vector Graphics file is really a text file in its details, you can view the text version of the file in any text editor. See our Best Free Text Editors list for our favorites, but even the default text reader in your operating system would work, like Notepad in Windows. An SVG File in Notepad++. For Saved Game files, the game that created the SVG file most likely uses it automatically when you resume the gameplay, which means you probably can't manually open the SVG file through the program's menu. However, even if you do manage to get the SVG file to open through an Open menu of some sort, you have to use the right SVG file that goes with the game that created it. If the game itself won't open the SVG file, try GTA2 Saved Game Editor, or open the SVG file in a text editor to see if there's something there that's of use. Converting an SVG file with an online tool like ours is usually the quickest and easiest way to get your file into the format you want. No need to already have an expensive program installed or to download unfamiliar software. If you need to convert it to a different format, like PDF or GIF, and your SVG is pretty small, then a third-party online tool like Zamzar will do the trick. Autotracer.org is another online SVG converter which lets you convert an SVG (from your device or through its URL) to some other types of formats like EPS, AI, DXF, PDF, SK, etc. If you have a larger SVG file, any software programs mentioned above in the How to Open an SVG File section should be able to save/export the SVG file to a new format, too. For example, if you're using Inkscape, after you open/edit the SVG file you can then save it back to SVG with any changes you make, but can also save it to a different file format like PNG, PDF, DXF, ODG, EPS, TAR, PS, HPGL, and many others. The Scalable Vector Graphics format was created in 1999 and is still being developed by the World Wide Web Consortium (W3C). Like you've already read above, the entire contents of an SVG file is just text. If you were to open one in a text editor, you would see only text like in the example above. This is how SVG viewers are able to show the picture — by reading the text and understanding how it should be displayed. Looking at that example, you can see how easy it is to edit the dimensions of the image to make it as large as you want without affecting the quality of the edges or color. Since the instructions for rendering the image can be easily altered in an SVG editor, so too can the image itself. What's an IGS File and How Do You Open One? What's an XSLT File and How Do You Open One? What's a DMC File and How Do You Open One? What's an MSG File and How Do You Open One? What's an MD File and How Do You Open One? What's a CMBL File and How Do You Open One? What's an IES File and How Do You Open One?